Finally, I am participating in Urban Jungle Bloggers, a monthly blog series that showcases indoor urban jungles founded by Igor Josif of Happy Interior Blog and Judith de Graaff of Joelix. This month's UJB theme celebrates the plant diversity of our urban jungles. Igor and Judith asked contributors to share "their personal 'plant gang'." My plant gang doesn't hang out all in one spot. 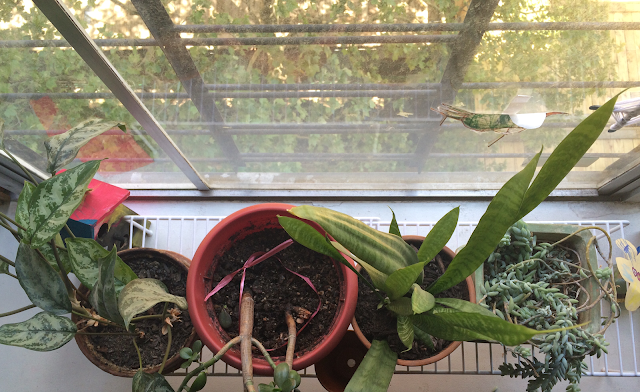 Four -- Chinese evergreen plant, jade, snake plant, and donkey tail -- are centered on the living room's windowsill. The larger of two Chinese evergreen plants sits happily across from the living room window, while the peace lily and pineapple top hang off to the side on top of a bookshelf. The larger of the Chinese evergreens seems to be thriving. Don't you love the plant stand?! It was a present at my garden-themed bridal party. The snake plant got off to a rough start but it is sending up lots of new leaves. The peace lily sent out a nice flower a couple of months ago. The pineapple top is sending out roots in a vase shallowly filled with water. The other plants are doing less well. A potential remedy is repotting; I have not repotted them in a few years. I will need my mother's help with this task; she has very green thumbs. Two of the plants are special. The snake plant was a gift from my youngest brother-in-law. The donkey tail started as a cutting given to my husband by his academic advisor when we lived in Berkeley. It moved via airplane with us to New York six years ago! As I mentioned before, it is one of the plants in the gang that has seen better days. In addition to repotting, I think it might fare better out of the reach of one of my littles who likes to harvest its leaves for potions. Thanks for reading about my plant gang. Please tell us about yours. To read about other plant gangs, follow #urbanjunglebloggers #plantgang on Instagram. You can also find UJB on Pinterest. P.S. Can you spot the bird house, the paper flower, the paper bird, the spider web, the giraffe, and the London planetree? Hahahaha I love it that your donkey tail is used for magic potions! Brilliant! Thank you for sharing your plant gang with us Urban Jungle Bloggers, Georgia!